"A very healthy, simple salad that works well next to a filet of steak or grilled tuna melt. Amount of vinegar and oil may be adjusted to taste." Place the zucchini slices into a steamer basket and set over one inch of water in a saucepan. Bring to a boil, cover and steam for 3 to 5 minutes, or until tender. Remove from the steamer and cool slightly. 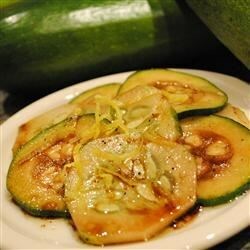 In a salad bowl, combine the zucchini and cucumber slices. In a separate bowl, whisk together the balsamic vinegar, olive oil, lemon juice, salt and pepper. Pour over the zucchini and cucumber. Toss to coat, then garnish with lemon peel. I personally didn't love it but my guestss thought it was an interesting dish. I substituted red wine vinegar, because I do not like balsamic. It was wonderful! I might try adding a little more lemon next time, to see what happens. It was pretty good but I would probably recommend adding onion to it for a little extra zip. I think it was a little bland. I added some chopped tomato and some chopped red onion with extra salt. Good for something different. Served with Ina Gartens meat loaf. My daughter thought it was too sour, but liked it better after I added agave and crushed pineapple. My other daughter thought it was pickles.